This past summer, we gave our copy of Josef Albers’s Interaction of Color some TLC. Our copy of Albers’s book is regularly used by students of Mike Glier in studio art here at Williams. Alber’s Interaction of Color consists of three parts: a volume referred to as “Text”; eighty individual folders containing color studies; and a companion volume titled “Commentary.” Only two thousand copies were printed. The screenprinting was divided up among three printing companies- R.H Norton and Company and Sirocco Screenprints (both in New Haven), and Homer Mitchell (in Detroit). Sixteen of the folders were unsuited to be screen-printed and were completed by a combination of four-color letterpress and offset lithography. 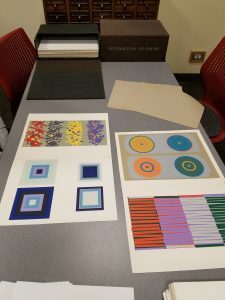 After the printing was complete in 1963, Yale art students helped Albers assemble every copy by inspecting every color print folder, folding and interleaving a slip-sheet, and manually inserting the three parts into a portfolio box. Most copies of the book were bought by museums, collectors, and academic institutions. By 1971, close to a half a million paperback copies had been sold worldwide. For our project we focused on the color study folders, pulling out the original interleaved slip-sheets and replacing them with buffered archival paper. 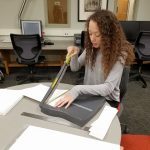 First, we cut the archival sheets of paper to size and placed them inside the color print folder. Archival slip-sheets help protect prints from damage such as ink that may transfer onto the opposite page from compression. We hope that our small contribution to this amazing book will help sustain the quality of the prints over time.